I always include some Rain Station or mopehead tracks on the compilation, but since I've been putting these comp discs out for years everyone has gotten the same Mark Harvey tracks year after year (a bonus or a minus?) plus a bunch of tracks from the 13thTrack.com Halloween Radio vaults. 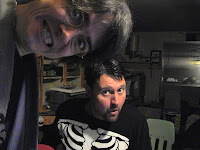 I went over to Jay's house on Sunday to record a new Halloween song (for the compilation CD and just to do it). It has been YEARS since we recorded DARK RIDE and subsequently "It's Halloween" and I just felt it was time to get another track out there into the universe. Jay and I have been recording a new disc at his place (not a Halloween disc mind you) using his Garageband set-up so this is our first Halloween song on Garageband (not that it will thrill anyone reading this). I'm a little partial to my own recording set-up, honestly, and we have a bunch of bass and drums tracks that I need to get to (what will become the new Rain Station Halloween CD). My studio has been out of commission for years now. Getting to record with Jay is therapy for me so I am hoping that this new CD we're working on PLUS this new Halloween track will be just the kick in the pants I need to get my studio set back up once and for all and then I can stop blogging about it, but rather have MORE free tracks to give away here. So, Jay and I recorded a tune we're calling "I'm Getting Spooky" and we have two mixes for you to download, listen to, discard or hopefully put on your very own Halloween compilation disc. So drop a line, let us know what you think of our quick little one day turnaround Halloween track.